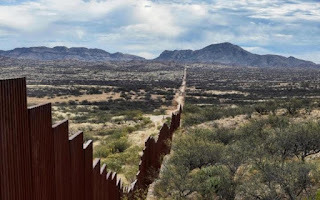 Excellent article on the wall with Mexico, by the Cato Institute. 1) Since a) the only effective wall would have to be a fully finished wall from ocean to ocean; b) legal and bureaucratic barriers make it unlikely that the Big Wall (Muro Grande?) gets built within four or even eight years (see the Cato article); and c) political support for a (half-finished) wall would likely decline under the next administration, then how likely is it that this project is a complete waste of taxpayer money? 2) Suppose the wall gets built, somehow, after all. Would then political support for the wall increase or decrease? 3) Once the wall is built, tearing it down looks like an invitation to illegal immigrants. Which arguments could a future president use to persuade voters that it's best to tear down the wall? (The only plausible one I can think of is the cost of maintaining the wall, likely to be in the billions). Final comment: An effective wall would also have to be the longest, tallest, deepest wall that it’s physically possible to build, which means the most expensive of all possible walls (and even then I question whether it would be effective). But political horizons being relatively short term, it’s unlikely that the super-expensive wall will get built. We’ll wind up with the worst kind of wall: a kind-of-expensive, but ineffective wall. Was Cantillon the real father of economics, or just the first modern economist? Richard Cantillon (c. 1680-1734) was an unusual figure in the history of economic ideas. His birth date and place of birth are not completely certain, but the consensus is that he was born between 1680 and 1690 in Ireland. He lived most of his life in Paris and was successful in amassing a fortune as a banker. His one book was evidently written around 1730 and was widely read in both France and England by intellectuals who were interested in economics. He died in England in 1734; his book was not published until 1755.
subsequent influence on writers, although his book was read by the physiocrats and cited by Smith in his Wealth of Nations. Even though it is a brilliant and insightful work, its only important influence that can be traced is on the physiocrat Frangois Quesnay. Cantillon himself acknowledged the influence of John Locke, for his theory of money, and William Petty, for his emphasis on the importance of measuring economic phenomena. Cantillon was part mercantilist (mostly in his views on foreign trade), part physiocrat (in his emphasis on the primary role of agriculture in the economy), and part physiocrat- classical (in his vision of the interrelatedness of the various sectors of the economy). Unlike Petty, who produced works of a practical nature exploring various topics in economics, Cantillon was modern in that (1) he started with the goal of establishing basic principles of economics through the process of reasoning, and, more important, (2) he wanted to collect data to use in the process of verifying his principles. Unfortunately, his statistical work is lost. Cantillon’s seminal vision, which was to a lesser extent possessed by some of thephysiocrats and liberal mercantilists, was of a market system that coordinated the activities of producers and consumers through the medium of individual self-interest. The key actors in this self-regulating system were entrepreneurs, who, in their pursuit of profit, produced social results superior to ones that could be produced by government interference. Given competitive markets in which entrepreneurs pursue customers in final goods markets and compete with one another in factor markets, Cantillon was able to point to the adjustment processes as demands, costs, technology, and other factors change. He did not make the plea for laissez faire with the force of Smith, however, which may account for his neglected recognition. He tended always to treat any element of the economy as part of an integratedstructure; for example, population changes were endogenous to his system, not exogenous. His explanation of the forces that determine prices was surprisingly modern in that he distinguished between market prices, determined by short-run factors, and what he called intrinsic value, long-run equilibrium prices. He was able to apply his analysis of prices and markets to international trade and view the adjustment processes that take place there. Some of his most accomplished technical analysis was not in microeconomics but in the macroeconomic aspects of the effects of changes in the supply of money on prices and production. He divided the economy into sectors and analyzed the flow of income between them; although he did not explicitly formulate an economic table to represent these flows, he clearly influenced Quesnay, who did. Cantillon acknowledged his debt to John Locke and his early statement of the quantity theory of money, but Cantillon was able to see subtleties in Locke’s analysis that escaped Smith and his contemporaries. The consequences of an increase in the quantity of money were not simply macroeconomic effects on output or prices. In an early examination of the microeconomic foundations of macroeconomics, Cantillon saw that the points at which the new funds entered the economy would influence their impact. Accordingly, the general level of prices could change, but relative prices could also change, with subsequent impacts on the various sectors of the economy. As we suggested in the closing pages of Chapter 1, historians of economic thought must make choices about how much attention to give to various economists. Our criteria assign great weight to the impact of a given writer on the subsequent development of economic ideas, not to his or her creativeness or brilliance. If our criteria emphasized who said it first or who said it best, Cantillon would have a place alongside Smith as a founder of political economy. MRUniversity (4-minute YouTube video, in their course on Great Economists). The Mises Institute, with a link to Cantillon's main (only?) opus, and his biography. 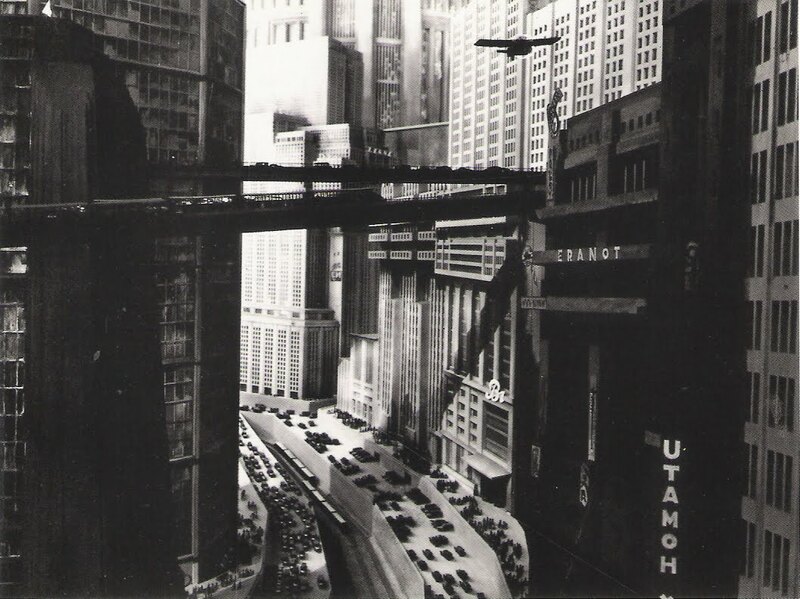 "What futurists actually do is facilitate as groups of people work through a highly structured, sometimes months-long process of coming up with as many hypothetical futures as they can, in order to prepare for more or less anything." "When Ms. Webb and I settled on the future of self-driving bus transit, we at first imagined that the group transport services proposed today by Lyft Inc. and Uber Technologies Inc. might be the death of bus stops and pre-planned bus routes. But as we picked apart our assumptions, it became clear that the predictable nature of most commutes would mean not dynamic bus routes, but routes that were simply better informed by data about where and how often people actually need mass transit." "One thing all the futurists I talked to had in common was disdain for anyone willing to attempt to predict the future. In futuring circles, paradoxically, this is the mark of an amateur. Actually practicing futurism, even if only for a day, showed me the reason the future is so confounding: Aside from the fact that anything can happen, those unexpected events rapidly compound on one another. This leads to second, third and nth-order effects that can seem completely beyond the realm of plausibility until they happen. Hence the impossibility of predicting financial crises, wars and technological revolutions." That's from the Wall Street Journal, in an article about futurism (as a profession, not an artistic movement). Now that's a job that grabs my imagination. Published in the May/June issue of the Financial Analysts Journal (vol. 72, no. 3). I'm not sure it it's gated, so you can find a working paper (from 2013!) version here. Robert Shiller’s cyclically adjusted price–earnings ratio, or CAPE ratio, has served as one of the best forecasting models for long-term future stock returns. But recent forecasts of future equity returns using the CAPE ratio may be overpessimistic because of changes in the computation of GAAP earnings (e.g., “mark-to-market” accounting) that are used in the Shiller CAPE model. When consistent earnings data, such as NIPA (national income and product account) after-tax corporate profits, are substituted for GAAP earnings, the forecasting ability of the CAPE model improves and forecasts of US equity returns increase significantly. "In this article, I offer an alternative explanation of the elevated CAPE ratio. The nature of the earnings series that is substituted into the CAPE model has not been consistently calculated for the long period over which Shiller has estimated his CAPE equations. Changes in accounting practices since 1990 have depressed reported earnings during economic downturns to a much greater degree than in the earlier years of Shiller’s sample." reported earnings series that Shiller used in computing the CAPE ratio, have undergone significant conceptual changes in recent years. A more generous earnings concept is operating earnings, which often exclude such “one-time” events as restructuring charges (expenses associated with a company’s closing a plant or selling a division), investment gains and losses, inventory write-offs, expenses associated with mergers and spinoffs, and depreciation or impairment of “goodwill.” But the term operating earnings is not defined by the FASB, and companies thus have some latitude in interpreting what is and what is not excluded. In certain circumstances, the same charge may be included in the operating earnings of one company and omitted from those of another. Because of these ambiguities, several versions of operating earnings are calculated." "The definition of reported earnings has undergone substantial changes in the last two decades. In 1993, the FASB issued Statement of Financial Accounting Standards (FAS) No. 115, which stated that securities of financial institutions held for trading or “available for sale” were required to be carried at fair market value. FAS Nos. 142 and 144, issued in 2001, required that any impairments to the value of property, plant, equipment, and other intangibles (e.g., goodwill acquired by purchasing stock above book value) be marked to market.9 These new standards, which required companies to “write down” asset values regardless of whether the asset was sold, were especially severe in economic downturns, when the market prices of assets are depressed. Furthermore, companies were not allowed to write tangible fixed assets back up, even if they recovered from a previous markdown, unless they were sold and recorded as “capital gain” income." "A distortion related to the Standard & Poor’s methodology for computing the P/E of an index—what I call the “aggregation bias”—overestimates the effective ratio of the index when a few companies generate large losses, as happened during the financial crisis. S&P adds together the dollar profits and losses of each S&P 500 company, without regard to the weight of each company in the index, to compute the aggregate earnings of the index. This procedure would be correct if each company were a division of the same conglomerate and one wished to determine the P/E of that conglomerate"
"Because of changes in the definition of GAAP earnings, it is important to use a definition of corporate profits that has not changed over time, as in the series computed by the national income economists at the Bureau of Economic Analysis (BEA), which compiles the national income and product accounts (NIPAs)." "In forecasting future 10-year real stock returns, the highest R squared is achieved by using NIPA profits for specifications of the CAPE regression, with either the price index portfolio or the total return portfolio." Siegel offers alternative estimates of how over-valued the S&P is, according to each CAPE measure, as well as estimates of future returns. The CAPE that uses the NIPA profit measure produces the lowest over-valuation and the highest expected returns. I'm generally sceptical of such estimates, so I won't go into those details. What I got from this paper is a reminder that the S&P measure of profits (and perhaps other measures that rely on reported earnings) has changed over time, due to accounting changes, so one has to be careful when using it. "where students often drop out and generally don’t receive the chance to engage with a human instructor. With more human-like interaction, Goel expects online learning could become more appealing to students and lead to better educational outcomes." This brings up the possibility of increasing returns to capital, at least up to a point. Here, the internet made MOOC's possible, which in turn made robots more valuable. "I had the same doubt last week [whether the TA was a chatbot] because we were getting such speedy responses from TAs." " 'A really fun thing in this class has been once students knew about Jill they were so motivated, so engaged. I’ve never seen this kind of motivation and engagement,' Goel said. 'What a beautiful way of teaching artificial intelligence.' "
"The general rule of thumb within the Fed is that labor market data trumps G.D.P. data." "Once major central banks hit the zero lower bound, the key issue was whether central banks would be able to keep inflation expectations consistent with inflation targets." "I think the Brexit vote, there are a couple of aspects of this that make it much less of an international macroeconomic event. It’s a scheduled event; you can track which way the vote is going to go by looking at polling; and it’s a long-term strategic vote on the part of the U.K. The day after Brexit — even if they vote to leave — nothing would actually change in terms of the trade arrangements. Those would continue for at least two years." "The norm in central banking, away from the zero bound, is to say, “We have set the policy rate exactly where we think it should be for today, given everything that’s going on in the economy, and in the future we’ll look at the data.” You didn’t do this kind of dot-plot thing. [...] I’ve wondered if we should get back to something that’s more akin to that. We don’t want to give unintentional commitments." "I’ve actually argued that unconventional policy works reasonably well. But it’s far less clear how it works, or how effective it is." "I’ve always been worried that the long run here is the Japanese outcome. I still hold out hope that that’s not the case, but I am worried about it, and it’s been going on for a very long time. If you talk to people in Tokyo, they say, 'Well, we’ve been through this and tried all these things, and you guys are just following us.' I hope that’s not exactly true. [...] I still hold out some hope." "I’m not as big an advocate of fiscal policy as some other people. It’s very hard to do very much on a business cycle time scale, given the fact that you’ve got to work with Congress." "At some point something will happen and we’ll be back in recession, and by almost any reckoning we will not have much that we can do in the way of lowering our policy rate." Atlanta Fed's nowcast of Q1 GDP (0.6%) was really close to preliminary estimate announced today by BEA (0.5%). Atlanta's was much closer than the New York Fed's nowcast (0.8%). The question is which of the two nowcasts will be closer to the final estimate, after revisions (available in late June). Gavyn Davies and Juan Antolín-Díaz explain why these two nowcasts can differ so much from each other, and from their own nowcast at Fulcrum Asset Management. The Atlanta Fed's approach consists of "bean counting," i.e. they mimick the way the BEA calculates GDP by aggregating monthly data as they are released. The New York Fed's and Fulcrum's methodologies are both dynamic factor models, which extract a "common factor" from multiple time series (not only those used by BEA to estimate GDP). 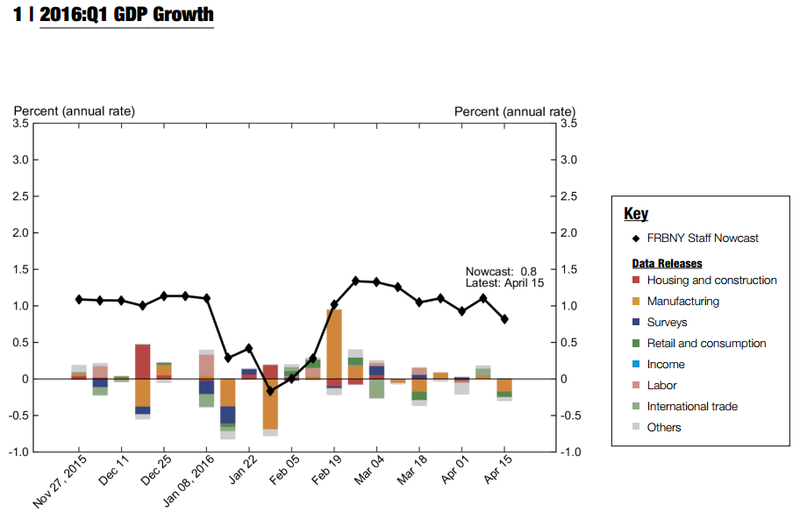 This underlying growth can then be scaled to match certain properties of the GDP time series (as the New York Fed does), or not be scaled (which is the approach they prefer at Fulcrum). A little closer to Italy. The fragmentation of the vote was the expected and actual result of yesterday's general election. 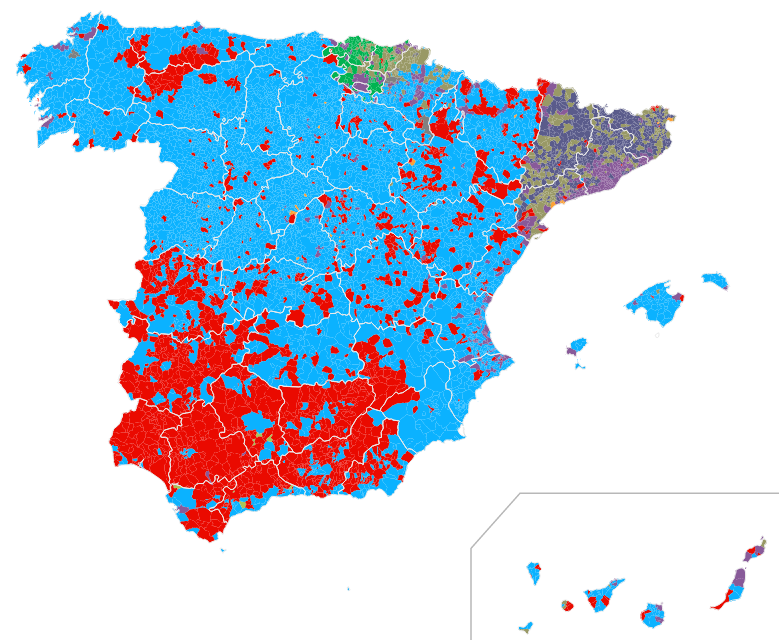 Incumbent Partido Popular (PP - moderate right) won the most votes, but came far short of the majority it had obtained in 2011. 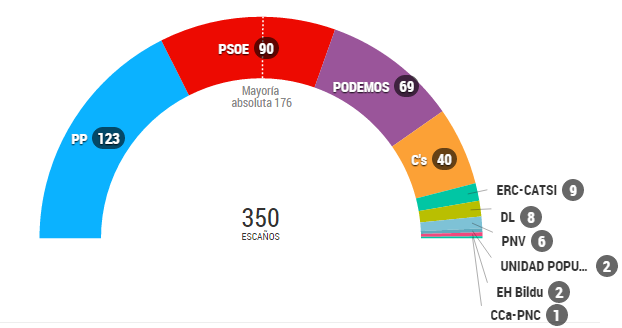 The main other party, Partido Socialista (PSOE - moderate left) might be able to form a government coalition with the new Podemos (far left), but they will still need the support of a motley crew of smaller parties in order to reach the 176-seat majority. Another possibility is a core coalition of PSOE with Ciudadanos (C's - center), plus somebody else. But that seems even less likely, as Ciudadanos promised during the campaign that they wouldn't join forces with either Podemos or nationalist parties. A grand coalition of PP and PSOE, à la Germany, would be unpalatable for PSOE - and its demise as the leading party on the left. After the first vote to form a government, which the incumbent prime minister will presumably lose, the parties have two months to form a government coalition before they must call fresh elections. Any coalition will be uneasy and precarious. Partido Popular has made bitter enemies during its four years in government. It's been an acrimonious election campaign. The programs differ wildly across parties. Whatever government they form, I think significant advances on important legislation are unlikely over the next four years (labor market, changes to the Constitution, education, Catalonia's independence referendum). Another important (and surprising to me) result was the decline of nationalist parties in Catalunya and Euskadi, and the rise, in those same regions, of the new left-wing party, Podemos. As a pro-referendum force, Podemos could actually do more for the independence cause than either the Catalan or Basque nationalists on their own. Yesterday's elections gave Podemos 69 seats, more than all the nationalist parties combined ever got in any general election. It's still doubtful, however, whether Podemos will be part of the new government. Moreover, those 69 seats won't belong to a single parliamentary group, as Podemos is itself an umbrella brand that includes a cluster of regional, left-wing parties with their own agendas. Messy. Bumpy. And thoroughly entertaining. Can you spot which two regions are different?